Bohman (ボーマン Bōman) is character in the second season of the Yu-Gi-Oh! VRAINS anime. He is described as a mysterious Duelist who works with Haru towards their goal. Bohman is a dark-skinned man, with orange eyes that have the irises lined in yellow. His hair is long and wild, flaring out in the shape of his shoulders, and is predominantly brown, but is blonde on the top with a small section of red at the border between brown and blonde hair, and a thin orange fringe, eyebrows, a large bang of orange hair, and orange braids held in aquamarine bands that extend from his sideburns. An aquamarine diamond symbol is on his forehead and chin; the one on his chin melds with his red "chin-strap", which in turn melds with the pink sections on his cheeks. Bohman is extremely muscular, leaving his upper torso mostly bare in his first outfit and having abdominal muscles patterned on his armor in his second. Bohman appears in a different outfit within LINK VRAINS in each of his appearances; he has appeared in three different outfits so far. In the first, he wears a skintight jumpsuit that is silver on the legs, purple on the knees and calves, and blue on the feet and the torso, which exposes his abs, chest, and shoulders; the torso section covers his sides and underarms, and wraps around his biceps, ending in purple cuffs. In the second, he wears a black chestplate with a broad, gold-lined collar and shoulder pauldrons, pink lines across his collarbone, and white sections on the thigh pauldrons. He also wears long black finger-less gauntlets with pink backs on the hands, golden cuffs, knuckles, and wristband on his right wrist (his Duel Disk covers his other wrist), white pants, and black calf-length boots with his symbol attached to the knee and extending midway up his thigh and down his shin, in addition to a red belt buckle resembling a wolf's head. 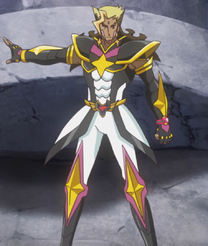 His third outfit is a more military garb resembling that worn by Jin Kusanagi in LINK VRAINS; he wears a white sword-shaped mantle with a gold border and a blue tip and shoulderpads. Under this mantle he wears a long black coat with a purple band at the hips below an orange belt, and with golden edges. He also wears blue gauntlets with golden cuffs, black boots with blue soles, and white pants. 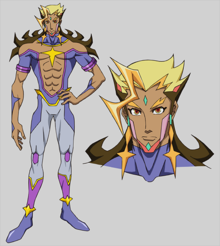 As with all members of Lightning's organization, a strange, star-shaped symbol resembling the Southern Cross appears prominently in Bohman's design, occasionally attached to a diamond-shape at one of the points; a yellow one on his bare chest, yellow ones on his ankle cuffs, orange sections that are part of his braids, and blue ones on his forearms in his first outfit. His armor retains the star on the chestplate, and has pink-lined golden elongated stars on his knees and forearms. His military garb has the star on the mantle in orange, and in gold on his gauntlets and boots. Bohman's name may be a reference to the character David Bowman from the science-fiction film 2001: A Space Odyssey, which also includes a character named "Hal". Bohman vows to defeat Playmaker. When Playmaker reached the area in which Bohman was detected for the last time, the latter (along with Haru) appeared on top of the statue of a soldier and was challenged by Playmaker. Bohman stated he wasn't after Ai, stating he would bring Playmaker to justice and make him pay for his crimes. Even though he was aware Playmaker knew about the ability of his "Hydradrive" monsters to attack directly, he still opted to go first and managed to Summon "Twin Hydradrive Knight" and activate "Judgment Arrows", while also Setting two face-down cards, describing them as the "cards that would decide the Duel's outcome". Playmaker was able to bypass the effects of both "Judgment Arrows" and "Twin Hydradrive Knight", destroying the latter, and also Set two cards face-down. During Bohman's turn, he activated one of his Set cards, "Property Spray", a card that Playmaker was already expected, which he then negated using "Arrow Break". However, to Playmaker's surprise, Bohman had already seen through his plan, and he had only used "Property Spray" to force Playmaker's Counter Trap. Bohman proceeded to activate the card he actually wanted to, "Hydradrive Cycle", using it to Summon "Twin Hydradrive Knight" again. After destroying all of Playmaker's monsters, Bohman revealed that during the Lost Incident, each victim had a backup copy of their thoughts saved, and during one of the experiments, something went wrong and one of the victim's real personality was switched with the one stored in the backup, imprisoning the original consciousness inside the database. 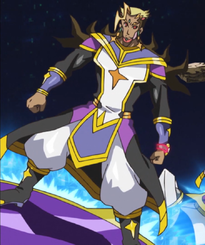 He then revealed that he, Bohman, was the original consciousness trapped outside his own body, and the one inside his real body was none other than Playmaker, showing as evidence the fact he was able to predict Playmaker's every action as a Duelist. Decided to have his body returned to him, Bohman vowed to win. Bohman with "Coolant Hydradrive" and "Burn Hydradrive". Bohman plays a "Hydradrive" Deck, focused on weaker Link Monsters that gain effects based on the Attributes of the opponent's monsters, while intentionally keeping his LP low, but also including cards to increase his LP. With the addition of the Link Spell "Judgment Arrows", which doubles the ATK of the Link Monsters it points to, his weaker "Hydradrive" monsters that can attack directly are able to inflict massive damage. ↑ Yu-Gi-Oh! VRAINS episode 48: "Judgment Arrow"
↑ "The Organization | [VRAINS] More Info On Season 2". YGOrganization. March 20, 2018. Retrieved April 22, 2018. ↑ Yu-Gi-Oh! VRAINS episode 57: "Final Battle Above the Clouds"